When most of us think of tiny homes, we think of refurbished containers or buses that are outfitted to serve as a home. 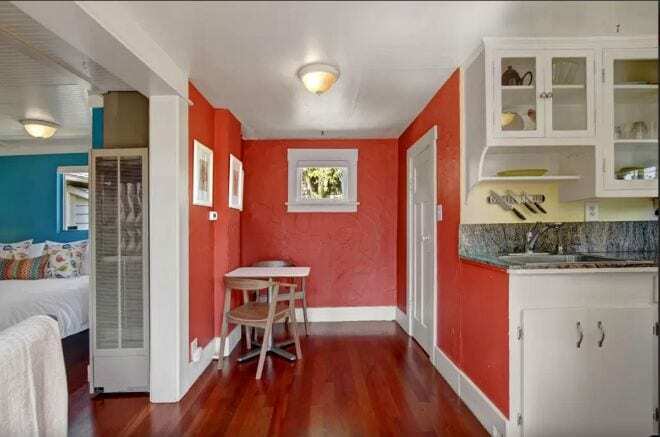 But why can’t a tiny home look like a regular home? Well, this one does. 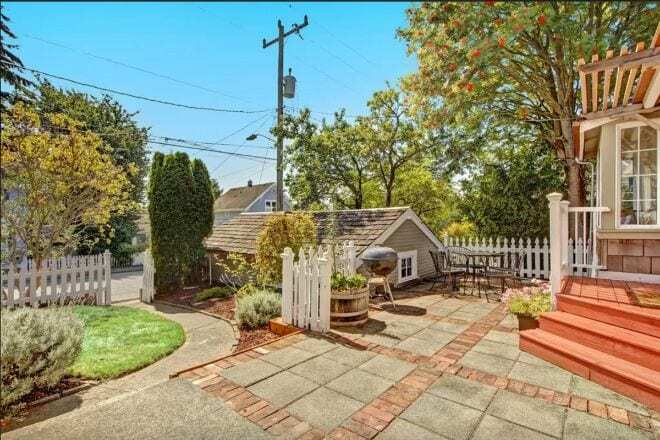 This home in the Ballard neighborhood of Seattle is just as adorable as any other quaint home you’ve seen… white picket fence and all. It really is a gorgeous home on the inside and out. The home is surrounded by beautiful tall trees and is landscaped to perfection. The exterior is surrounded with a white picket fence, outdoor tile, and cedar chipped garden beds with plants and flowers. There’s also a small barbecue grill, a grassy area, and some outdoor table and chairs. The house’s wooden paneling gives it a warm and cozy feel. 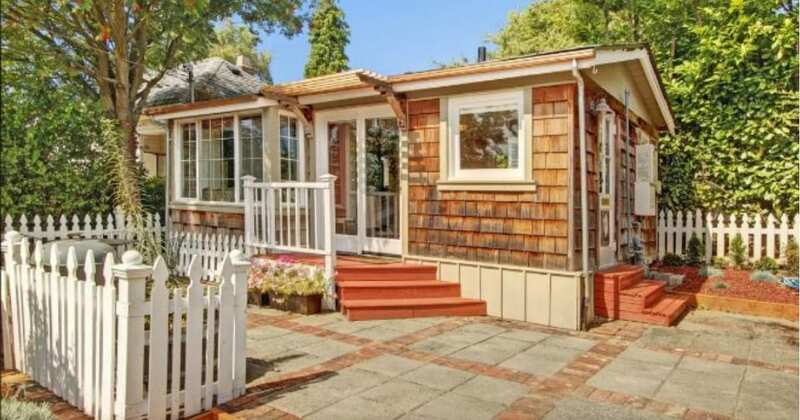 It’s the cutest exterior to a tiny home that I’ve ever seen. When you walk inside the home you’ll find Brazilian cherry floors throughout the entire home. The entry to the house brings you into the light yellow painted kitchen. 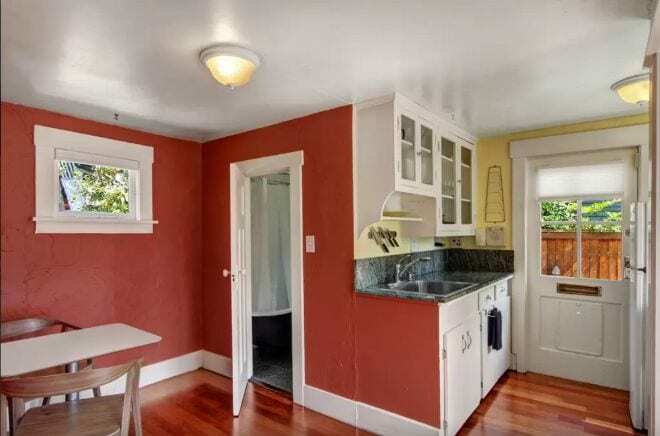 There’s scaled down refrigerator, small countertop with some shelving, and an oven stove combo. A large window behind these appliances lets in lots of natural light. Adjacent to this is some overhead cabinetry with pretty glass doors. 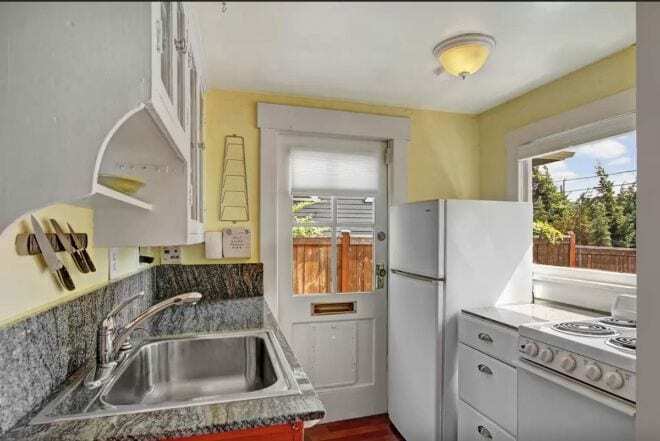 There is a large granite countertop with a full-sized sink. There’s also extra cabinetry below the countertop. Behind the kitchen is the bathroom. The mint-green colored bathroom features a full-sized bathtub and shower, toilet, sink, and mirror. 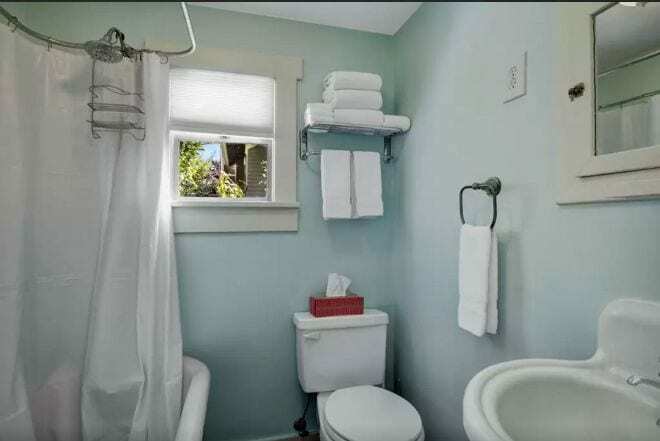 Hanging shelves are used to hold towels and save space. The kitchen opens out into a dining area where there is a table and some chairs. The burnt-orange colored dining area also has a window to let some more natural light in and accent the overhead lighting fixtures. This space opens up into the bedroom. 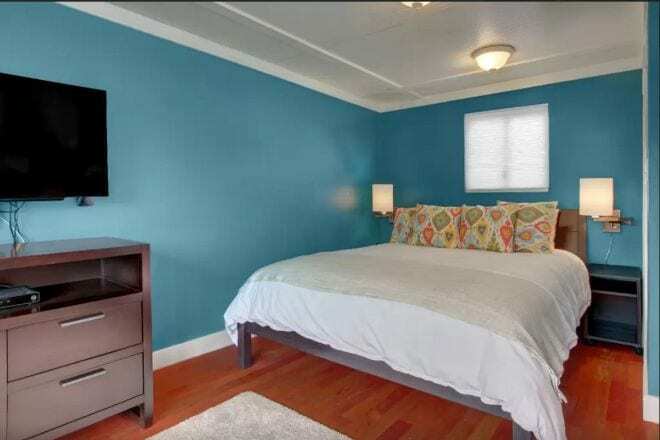 The bedroom is painted a pretty blue and has space for a large king or queen-sized bed. The ceiling has white painted wood panels which make the room look larger. 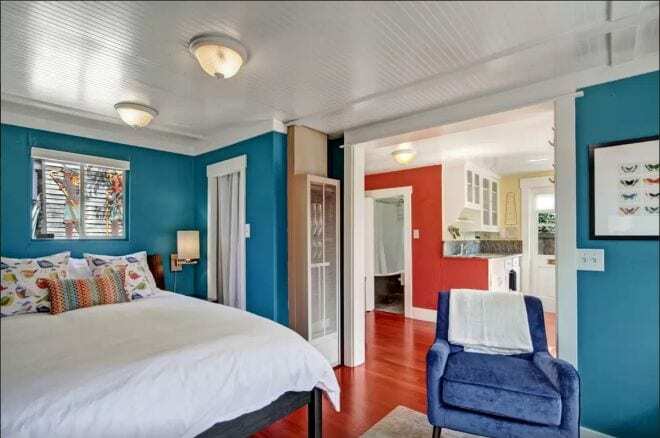 There is a window above the bed and lots of cute decor. On the opposite wall is a large beautiful window seat with storage drawers built in underneath it. There is also a dresser and a large TV on the wall. 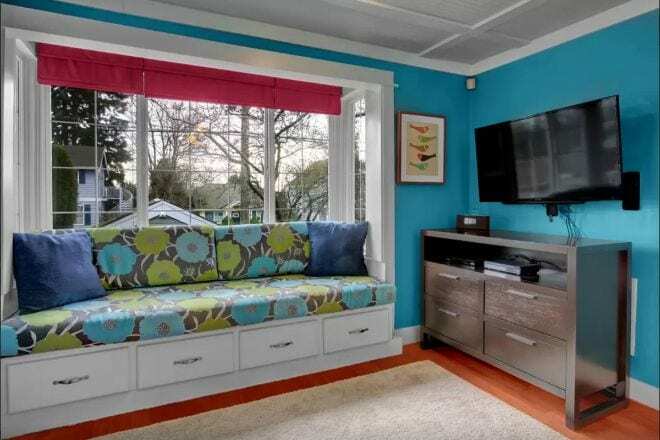 You can catch up on your favorite TV shows from the window seat or the bed. The home was previously listed on Airbnb but it’s no longer listed. I wouldn’t be surprised if someone scooped it up as their forever home.